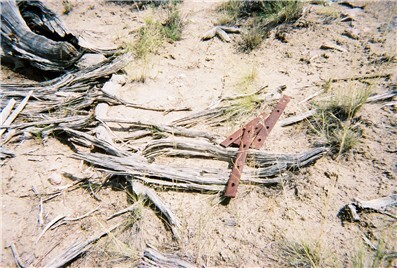 Some years ago, near Independence Spring, East of Moor, Nevada, a Chinese camp was found following a fire that destroyed the vegetation in the area. In that camp, best described as numerous depressions in the Earth, was broken Chinese pottery and many many opium cans. The mystery was "how were the depressions covered?" What manner of tents were used? The past 10 days were spent in Eastern Nevada attempting to unravel this mystery. To this end, the attached photos are offered for your appraisal. The first photo is a wooden structure, the highest point is no more than 20 inches, the width is 36 inches, the length is 5 feet. The depression under this structure is perhaps 10 inches deep. 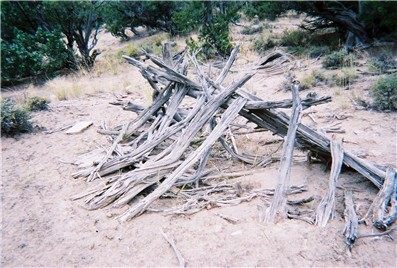 Immediately to the left of this structure there is the remains of another similiar structure, but it has caved in, the wooden members are flat to the ground. Two feet from the item pictured are four 'fish plates', that fit identically to CPRR 56 lb. rail. These four fish plates are shown in picture #2. Their use is unknown to this writer, I SUPPOSE they were used as weights to hold down a canvas tent, or perhaps to fashion a fire pit grill. I saw no ashes at that site. These living quarters are about 3 miles EAST of Toano, Nevada, near the old grade. Found lying on soil adjacent to these items were pieces of broken Chinese pottery; a soy sauce jar, broken blue on white porcelain bowls, and one musket ball, judged to be .30 caliber. During the trip, I took over 80 photographs of this and other sites, these pictures will be displayed on the CPRR Museum site in a few weeks. Most pictures were taken within a short distance of the old CPRR grade, with the exception of a few pictures of mining 'ghost towns' and related relics. Please note that all relics were left undisturbed, only pictures were taken. I might be worthwhile to take a look at the Cultural Landscape report prepared for Golden Spike National Historic Site. It shows a few dwellings. Rooting around the golden Spike web site especially in the "In Depth" section, there are a number of other interesting papers. I had heard for many years of the existence of the tent frame in the Pequops, it was interesting to find it, along with the fish plates and remains of Chinese porcelain, opium cans and other items scattered in the vicinity. In all the other Chinese camps that I visited in the past week, only the depressions were evident, no other tent frames were found. Also see a question about opium cans.